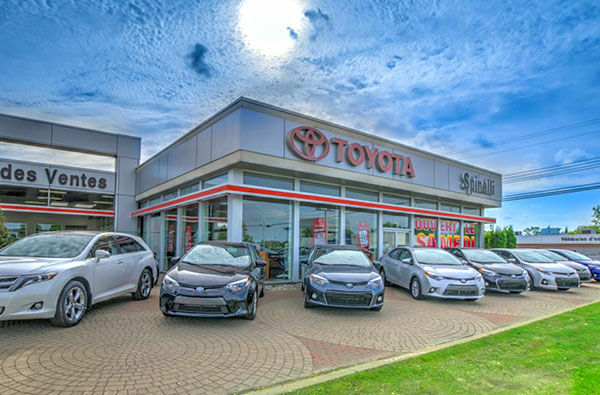 Located at 10 Avenue Auto Plaza in Pointe-Claire, Spinelli Toyota Pointe-Claire is your trusted dealer to purchase your next Toyota vehicle and for all your necessary Toyota services in Montreal. Come see us today! We’ll work hard to ensure your complete satisfaction each and every time you visit. At Spinelli Toyota Pointe-Claire, we take the time to answer your questions and, most importantly, listen to your needs in order to offer you a shopping experience that will fulfill all your expectations. For a new Toyota vehicle in Montreal, come into Spinelli Toyota Pointe-Claire today. You'll find the complete lineup of new Toyota models like the Toyota Corolla, the Toyota Camry, the Toyota RAV4, the Toyota Highlander, the Toyota Yaris and more. At Spinelli Toyota Pointe-Claire, we also offers a full range of after-sales services including detailing, maintenance, a complete tire centre and genuine Toyota parts and accessories. We also offer our customers exclusive programs such as our My Spinelli loyalty program and our Express Service. For more information about new Toyota vehicles and our after-sales services, contact us by phone at 1 844 725-3440, or by using our online contact form.